Employment Agencies in Vegas - How to Stay Awake at Work! How to Fight the Midday Slump! Does this sound familiar? At work, you’re going full steam ahead all morning, crossing things off your to-do list and feeling productive. You take a quick break for lunch and figure you’ll dive right back into your work and power through the afternoon. But somewhere between 2 and 3 p.m. you find your attention wandering and your energy flagging. In fact, all you really want to do is take a nap. How can you fight this slump? Drink Some Water. Being even slightly dehydrated will lower your energy and often make you think that you’re hungry, which is why too many of us head for the vending machines and the sugary snacks. What you really need is water. Drink a full eight ounces of cool water to revive yourself and your body. Get Up and Move. Sitting in front of a computer all morning, as most of us do, is an energy drain. Stand up, stretch, and take a quick walk–if you can’t go out and walk around your building, go up and down the stairs a couple of times, or just visit a friend in a far-off department. Get your blood pumping and your heart rate up to re-energize your tired body. Refocus Your Focus. Have you been working on the same project for hours and feel your head getting heavy? Switch to a different project, at least for a few minutes. Your mind works better if you can change gears once in awhile. When you go back to the original project after the break, the cobwebs in your brain should be gone. Just Breathe. But do it right. Shallow breathing creates less oxygen running through your system. Focus on deep breathing for a few minutes. Breathe in through the nose and out through the mouth for a count of five on both the inhale and the exhale. Fill both lungs, feel your ribcage expand outward, then exhale, emptying your lungs and feeling your ribcage collapse. Repeat 10 times. Have a Healthy Snack. 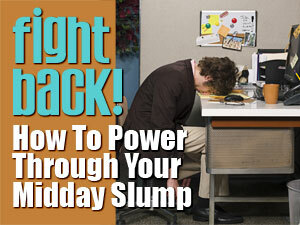 Often, a midday slump is due to your blood sugar levels dropping. Instead of succumbing to the munchies or those sugar cravings, eat something small and healthy: a piece of fruit, yogurt, a handful of nuts or a wedge of cheese and a few crackers. Sugary, fatty snacks will make your blood sugar soar, then crash, making you feel more sluggish than before. When you find your energy lagging after lunch, know that you can do something about it! You’ll be happier, more productive and less tired when you learn how to control that drop in energy.